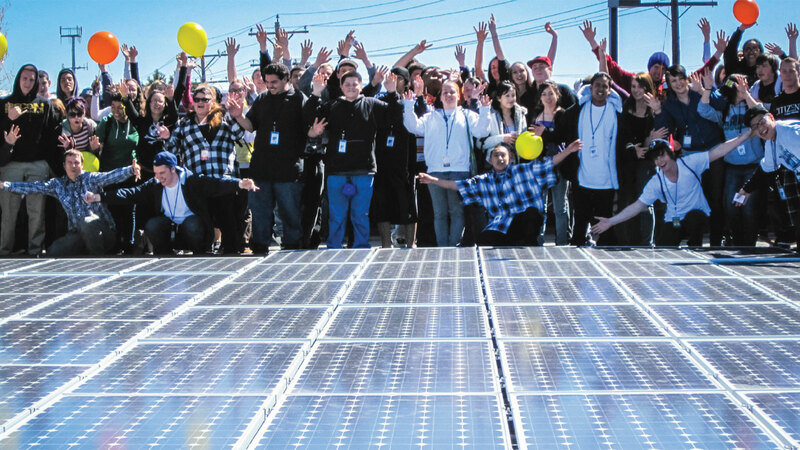 Goals provide an opportunity to institutionalize a shared vision of a solar-powered future. Some cities have established solar goals as a part of a broader commitment to 100 percent renewable energy, while others have stand-alone solar commitments. San Diego, which has one of the highest installed solar capacities in the country, aims to generate 100 percent of all electricity used within the city from renewable sources by 2035. Solar energy makes up a large part of the city’s plan to achieve that goal. Such commitments that apply to the entire community drive the most progress in both distributed and utility-scale solar. Cities can set an example, boost the local solar market and save on electricity bills by installing solar projects on public buildings. The city of New Bedford, Massachusetts, has reduced electricity spending by installing solar power on city buildings and public spaces, including installations on three schools, a public gym and the Department of Public Infrastructure Building. The Property Assessed Clean Energy Program (PACE) allows local and state governments to loan money to home and business owners for energy improvements, which they repay over time through property taxes. Cities can also partner with local financial institutions to offer competitive loans for solar projects. The “Milwaukee Shines” program, for example, partnered with Summit Credit Union to offer low-interest loans of up to $20,000 for eligible solar PV installations. Partnering with local solar installers to allow customers to lease panels over time can also help reduce up-front costs. Bulk purchasing programs allow businesses, homeowners and nonprofits to purchase solar energy collectively, thus lowering the cost for everyone involved. Portland, Oregon, was the first to offer a “Solarize” bulk purchasing program, and many other cities have followed suit. In less than five months, “Solarize Athens” more than tripled the residential solar energy capacity in the Athens, Georgia, metropolitan area. Community solar programs allow customers to support and benefit from solar power projects in their communities. Customers can either own a share of a community solar project, or they can subscribe through a Power Purchase Agreement (PPA). Cities can work with their utilities to offer both alternatives. For example, through the Tallahassee Solar program, city residents and businesses signed up to purchase electricity from a community solar farm at a fixed rate. Non-hardware costs like those associated with zoning and permitting now make up about two-thirds of the total price of residential solar systems. So, cities can eliminate barriers by reducing fees, making permitting rules clear and readily available, and expediting permitting processes. The Department of Energy’s SolSmart program can help cities reform their permitting processes. West Palm Beach and El Paso provide online applications with same-day approval; actions that helped both achieve SolSmart Gold designation. Solar access ordinances guard homeowners’ right to generate electricity from sunlight that shines on their property, regardless of homeowners’ association policies. Local governments should also offer clear zoning regulations that allow solar energy installations on residential and commercial rooftops. The city of Bozeman, Montana, successfully changed its city code to remove barriers to installing rooftop solar. The Delaware Valley Regional Planning Commission offers a model ordinance guide that cities can apply to their own local laws. Some local governments have adopted policies to require new homes and buildings to have solar power or to be designed so that it can be easily installed. The city of San Francisco requires that most new buildings be constructed with solar energy systems already installed. The city of Tucson requires that any new single-family homes or duplexes either include a solar energy system or be “solar ready,” meaning pre-outfitted so that future solar PV and hot water systems are easy to add. Cities should encourage the electric utilities serving their areas – whether municipal or investor-owned – to partner with them in unlocking the potential of solar energy. Con Edison, an investor-owned electric utility, worked with New York City and the State of New York to launch a “100 Days of Solar” initiative. While many investor-owned utilities have been willing partners with cities in promoting solar energy, cities served by less supportive utilities may wish to consider forming a municipal utility in order to gain greater control over their local electric grids. 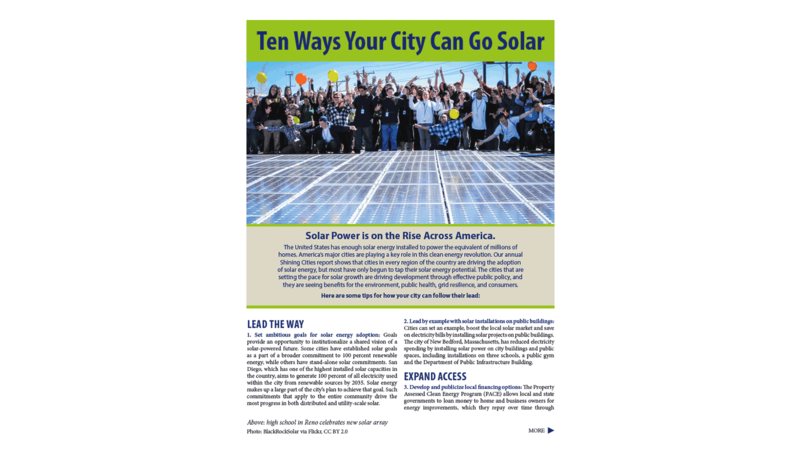 State policies can have a large impact on a city’s ability to expand solar energy, so it is important that cities use their influence to advocate for stronger state financial incentives for solar energy, ambitious renewable electricity standards, strong net metering and interconnection standards, and comprehensive solar rights policies. With a president and Congress who range from hostile to indifferent in their attitudes toward solar power, it’s more important than ever that we act locally on solar.